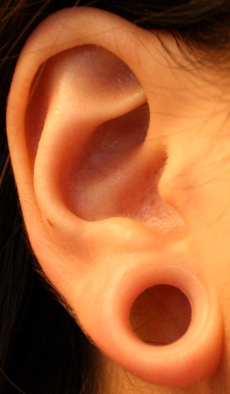 Aftercare for freshly stretched ears should be minimal. If you stretched your ears properly, there should be no tears or damage to your skin, and no need to treat your stretches as if they were fresh piercings. Above all: avoid using harsh chemicals on your ears (like rubbing alcohol or hydrogen peroxide) to clean them. After stretching, you may experience slight soreness or tingling, but any bleeding or significant pain should be dealt with immediately by removing your plugs and downsizing to your previous size. Wait until your ears are completely healed before attempting to stretch again. During healing, you can soak your ears in a warm saline (salt) solution to help clean and soothe your skin. Combine non-iodized sea salt and warm water, dissolving approximately 1/8" to a 1/4" of a teaspoon of salt into a cup (8 ounces) of water. Commercial saline solutions are also available in a convenient spray bottle, often sold as nasal decongestants or piercing sprays. Use any form of saline sparingly, no more than once or twice a day. Otherwise, you can keep your ears clean by washing them with an unscented natural soap with no dyes. Stay away from antibacterial soaps because they are too harsh. Wash gently around the edge of your jewelry, rinse clean, and gently pat dry. Massaging your ears regularly with oil helps to stimulate the blood flow in the earlobes and promote healing. Leave your ears mostly alone for the first few days after a stretch, but you can resume oil massaging once your plugs can be removed easily again and don’t feel overly tight. 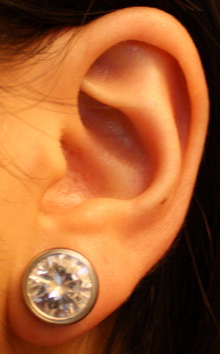 Once your ears are healed, you have more options for jewelry or you can continue on your stretching journey.